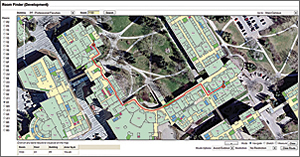 ArcGIS for Server provides the foundation for GeoDesign of university facilities. Integrating lidar data provided 3D modeling for new building sites. An integrated approach to design has saved thousands of dollars. The University of Calgary in Alberta is considered one of the top research universities in Canada. It has more than 29,000 students and more than 4,000 academic and support staff. The university began using GIS for academic research 20 years ago and has now standardized the management of its geographic information with Esri technology. Realizing the value of geographic analysis for informed decision making, it has expanded the use of GIS to manage not only academic data but also institutional and administrative data. The University of Calgary uses ArcGIS to manage a $1.5 billion expansion and maintain the facilities on its 200-hectare campus. The main campus has more than 20 academic buildings occupying more than 200 hectares, which is larger than Calgary's entire downtown core. In 2008, the university embarked on a $1.5 billion campus expansion, the largest capital expansion project in its history. Knowing that implementing a project of this size and continuing to maintain so many buildings would require a comprehensive understanding of every aspect of the campus—its landscape, people, buildings, and infrastructure—university planners relied heavily on ArcGIS and GeoDesign principles to help analyze and evaluate the impacts of design alternatives early in the development process. The university maintains institutional data used for facilities management in a central data warehouse. Esri's ArcGIS for Server serves as the front-end technology that pulls data from ARCHIBUS, Esri Partner (Boston, Massachusetts) and creator of a solution used to manage spatial data and real estate, infrastructure, and facilities information. These recently integrated systems enable users to visualize and analyze both interior and exterior building data that's important to understanding how the campus currently works. Defining how the landscape works and evaluating whether it is working well are key tenets of the GeoDesign framework for landscape change. Evaluation of current processes allows proper "baselining" and the identification of key metrics against which design alternatives can be measured. The result is improved site planning and facilities design optimized for cost-efficient management and sustainability well after the initial project work is complete. Understanding the physical constraints of a property is equally important. During site assessments, planners and landscape architects alike need to know how water flows across a property. This question came up early in the design phase, before construction, when the facilities management team approached the university's GIS team to create a campus drainage basin model. While there are no drastic slopes on the campus, there are low spots. Coupled with Calgary's high water tables, understanding these environmental issues was an important design constraint. If a basement is built in a particular location, the probability of flooding may be higher. Knowing where rainwater would drain allowed the team to see where flash floods might occur and then mitigate any potential dangers. Understanding the terrain—the physical lay of the land—and how it affects drainage across this particular landscape has proved to be invaluable. The drainage basin model has been leveraged in planning new building sites and the expansion of the storm sewer system, including an innovative research project for filtering surface water before it enters the sewer system. The interactive room finder provides the ability to determine the user's current location and find the best path to a new destination. The team combined light detection and ranging (lidar) data with high-resolution, orthorectified aerial photographs to create the drainage model data. ArcScene allowed decision makers to view and process the data in 3D while analyzing the effects of new construction sites on the existing grounds. Using lidar to map the campus allowed the team members to look not only on the ground but in the trees, as well. They recorded and processed the height of every tree on campus to provide even more information necessary for relandscaping after the expansion project, as well as to understand the position of shadows on potential buildings. Armed with this information, the team was able to optimize the planting of five trees for every tree removed during construction, along with native, low-water vegetation, helping the team achieve greenhouse gas and water use reduction goals. Once the surface models were completed, the team generated 3D building models to use for shadow simulations during the next construction phase. Traditionally, the models have been leveraged to ensure that new buildings do not obstruct the views of existing buildings. In this case, the shadow models were used to track the sun's effect on a glass exterior compared to a solid wall structure. This method of optimizing the heating mechanics of buildings is an important consideration in an area as far north as Calgary, where sun angles change drastically depending on the season. In the summer, the sun is high, creating narrower shadows; in the winter, the reverse is true. Simulating 3D shadow effects based on sun angle allowed team members to calculate just how long a building would sit in shade at any time of year, enabling decisions to be made on the heating needs and estimated costs to maintain the comfort level of that specific building. As with many GIS projects, the development of one application often generates additional benefits. With the surface models in place and the building sites located, there was an urgent need to model the campus irrigation system. An application was developed to help map the changes caused by the construction. The irrigation model also provided the ability to monitor water usage and maintain asset inventories. This innovative application created a model for managing 8,500 sprinkler heads across campus and has helped grounds personnel better understand and manage the system. Knowing the flow rate and tilt angle of each sprinkler, the university is now able to calculate the volume of water it sprays, as well as the area it covers. The application can be used for the life of the campus and allows it to conserve water by reducing overlap and avoiding spraying water on roads and pedestrian walkways. The GeoDesign process opened many new avenues to explore to increase efficiency around campus, even in areas where it wasn't expected. In a synergistic move with the new construction, the information technologies (IT) department also used ArcGIS to consolidate several computer centers where remote computer systems were once maintained. The consolidation freed up new space for faculty to use and has led to better communication and system coordination across campus. It also allowed a reduction in utilities costs for electrical and cooling systems. "Using GIS as a decision-making tool is a smart way of gathering all the things you already know and placing them in a single spot so you can see the entire picture," says Tom McCaffrey, GIS coordinator, University of Calgary. "Understanding each layer of data as a separate entity is one thing; combining several layers together to get a coordinated solution to a complex problem is a completely different scenario. It's the difference between thinking in two dimensions versus thinking in three or four." This understanding of how ArcGIS can be applied to different problems led the IT telecom group to reach out to the GIS team for help creating an application that would track telecom network lines, utility corridors, wiring closets, and utility shafts throughout the campus. While general maintenance for utilities and computer networking systems can be overwhelming if left unchecked, the ArcGIS for Server web-based application, when completed, will serve up 3D diagrams of the networks that administrators can edit and analyze at any time. Service technicians will also be able to trace, track, and repair faulty wires and equipment as these tasks are necessary. The system will enable them to monitor real-time data, plan networks, and prevent costly technical problems. Zoomed view in the room finder. The university currently needs to renew and maintain the exterior roofs of more than 90 buildings on several different campus sites. To make this process more efficient, the GIS team created a web mapping application that allows editing, updating, measuring, and reporting on government funding spent on reroofing the campus. Using ArcGIS, the team is now able to more effectively track life cycles and warranties of the roofing materials, which can potentially lead to thousands of dollars in savings on roofing jobs. Data on structures reported to the government is now documented using an accurate spatial and temporal method that provides strong accountability for how government money is spent. GIS has virtually eliminated the need for manual roof measurements that cost both time and money, as well as pose a potential safety risk. From a risk management perspective, the university has also used ArcGIS to enhance public safety. Using a current model of the campus and incorporating up-to-date floor plans, emergency preparedness and evacuation plans were developed. Models and processes were discussed with local authorities and emergency responders to generate a map standard that was distributed to these stakeholders. The safety team created different scenarios and determined several possible routes for building evacuations. These plans were posted on a central website to help fire wardens understand the proper evacuation protocols. Future plans to integrate live security camera feeds into a secure campus web dashboard would allow the creation of a mobile command and control center. ArcGIS was even used to design external lighting models for the university's safety walk programs. These models estimated ground illumination based on the type of light fixtures and any interference caused by vegetation or building shadows. Maps were then generated and given to grounds personnel to take corrective measures in illuminating unsafe areas. To help students and visitors easily find their way around campus, the university developed an interactive room-finder application using institutional data. 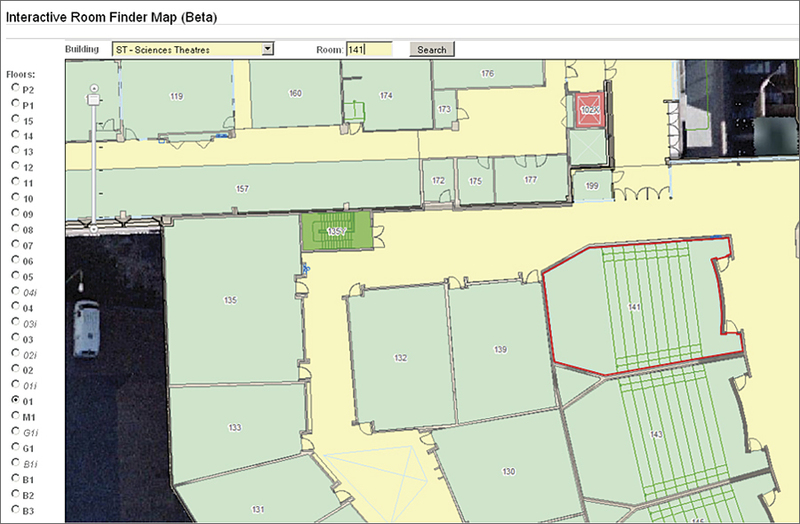 Users can input the building name and room number they wish to find, and the application generates a detailed map showing the floor plan with the desired room highlighted. Visitors can look up their destination using the online tool and determine the nearest parking area before arriving on campus. This enhances visitors' experience and helps them save time. The interactive room finder will soon become available on mobile devices. Users will be able to take a picture of a wall marker to determine their current location and then enter their new destination. The map will show several route options—shortest path, indoor or outdoor routing, elevator access for the handicapped, or stair access for those who want more exercise. Another future project will use administrative data to help students select classes based on spatial proximity. An application is being developed that will allow students to enter their ID numbers and generate maps that show their classroom locations, as well as the proximity to the next class, based on a specific time and day. This will help students familiarize themselves with the campus and select a schedule that offers reasonable travel times between classes. "GIS technology offers endless opportunities for our processes to grow," says McCaffrey. "Processes that used to take weeks can now be done in minutes. Being able to see the entire picture at once is an option we've never had before. 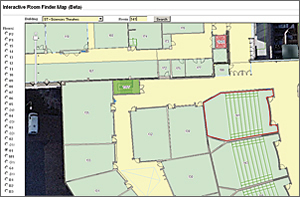 GIS allows us to plan at a much higher level than we could have ever imagined. Now, we look for new ways to view scenarios and come up with better ideas to manage them." With all the efficiencies gained in their research, institutional, and administrative processes using Esri technology, the University of Calgary earns an A for GeoDesign and is well on its way to becoming a university of the future. For more information, contact Tom McCaffrey, GIS coordinator, University of Calgary (e-mail: tmmccaff@ucalgary.ca). For more information on how you can put GeoDesign into practice, contact Mr. Shannon McElvaney, Esri (e-mail: smcelvaney@esri.com), or visit esri.com/geodesign.